Toms Curtain Cleaning Brisbane experts for Curtain Steam Cleaning, Curtain Dry Cleaning, Curtain Laundry & Drapes Cleaning Brisbane services. Call now on 1300 068 194 for Same Day Curtain Cleaning Brisbane. Our Company offers customer-oriented, efficient curtain cleaning service for residential and commercial properties. Curtain dry cleaning, mainly used for some delicate textile fabrics. This method uses a minimal amount of liquid and a blend of compounds for restorative cleaning. Dry cleaning must be clearly warned when a fabric includes acrylic yarns. This is not only the safest and effective method of cleaning, however the process is fast too. We also provide commercial Curtain Cleaning services in Brisbane like State Sports Centre, Admiralty House etc. If you don’t have time for curtain cleaning at home or office, we can also pick up your curtains for laundry cleaning and rehang curtains back. We specialize in professional steam curtain cleaning Brisbane using proper techniques for the purpose. Our steam cleaning method is a process consists of spraying hot cleaning solution into the curtain and recovering the solution with a powerful vacuum. The hot water, along with the suction power of the vacuum, forms a steam that will clean the curtain and at the same time, dries it up. Another notable benefit that comes from using professional curtain cleaning is that it is an incredibly effective way to dust and allergens deeply from your curtains. It is always important to keep in mind that curtains are one of the most visible items inside your house or office and therefore, should be kept clean. Each and every day, these curtains are handled by people and they work as a barrier between the outdoor environment and inside of the house. Now, curtain cleaning can be quite challenging if you have many windows in your house. This is one of the primary reasons why people need curtains cleaning services in Brisbane. Dust and dirt gradually piles up on its surface which is why you may have to clean those curtains on a regular basis. At Toms Curtain Cleaning Brisbane, We do not use any harmful chemicals and is therefore, eco friendly. The consequence of the process will bring about a marked improvement in the overall atmosphere inside your home. Different type of curtains require different cleaning techniques. Toms Curtain Cleaners Brisbane will carefully examine your curtains and will determine which cleaning method is going to be the best to clean your curtain and will apply it carefully. Our cleaners use different techniques, including dry curtain cleaning and steam cleaning according to curtain material. We use special cleaning solutions and powerful extraction machines for Curtain Cleaning Brisbane to remove pollutants, dirt, soil, and harmful bacteria. Using our on-site curtains and drapery cleaning service we make your curtains clean where they hang, there is no need to take down at all. The furnishings are in our care, we will comply with all the manufacturers care label instructions to preserve your fabrics and window furnishings looking as good as new with no shrinkage or color. If your home seems to be in renovating or some other process where our team come to your home, pickup, dry clean and and reinstall your window furnishings and draperies within a short period of time. Basic repairs and hook replacement will also be included when we clean your furnishings. It is important to keep in mind that curtain cleaning is a very time consuming task if you want do properly. Therefore, it is always recommended to hired a certified curtain cleaner to clean those curtains for you. This will save your valuable time so can invest in other important tasks knowing that your curtains are in good hands. 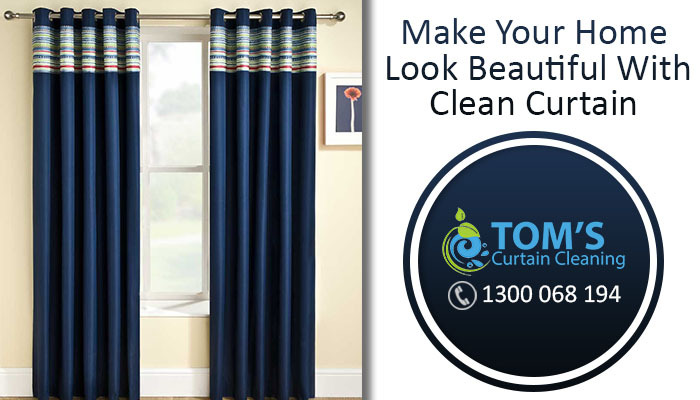 Toms Cleaning provides you Same Day Curtain Cleaning in Brisbane Our leading experts are available throughout 24/7 for Curtain Cleaning Brisbane, any day and time. You can contact us on 1300 068 194 around the clock . You discuss your needs at length with a friendly and helpful member of our team. They will tell you all that you want to know and provide you with details about our methods and pricing system. Just get in touch whenever you want either over the phone or by filling out our Inquiry form. It takes only a minute. At Toms Curtain Cleaning Brisbane, we have a comprehensive drapery cleaning service caring for the needs of homeowners, businesses, churches, and schools. As your local Curtain Cleaners Brisbane & Drapery cleaners, we are able to care for specialty fabrics such as silk, velvet, brocade, and more. Our attentive customer service staff will make note of any special instructions that you have for the cleaning process. Our dedicated and trustworthy staff at Toms Cleaning is ready to care for all of your draperies. No job is too big for our efficient staff. Our certified and trained Curtain Cleaners Brisbane are also expert for flameproofing curtains & drapes. Call 1300 068 194 today, get a free price quote for the cleaning of your draperies. Toms Curtain Cleaning Brisbane is specialized in providing safe and efficient curtain cleaning services for private, commercial and public service customers. We can offer you deep curtain cleaning at the best cleaning prices in the area. Our deep Curtain cleaning Brisbane services are all done with powerful and yet safe equipment and solutions. Our prices are all fixed, but we will give you serious discounts if you book more than one of our cleaning services at once. This means that we can clean your carpet and upholstery at once at an unbelievably low price. This will save you time, money and a lot of effort, and you will end up with a rejuvenated, sanitized and healthy interior. We offer deep steam or dry cleaning for your all kinds of curtains. Our one of cleaning service is hourly based and can include cleaning a single item or deep cleaning an entire room or property. So, if you live or work in Brisbane and are in need of professional assistance for cleaning your furniture or property, book our services now! Pre Inspection : Our professional curtain cleaners Brisbane test all curtains for fastness and dye bleed to help choose the correct cleaning method. Curtain Vacuuming : To ensure all dust and dirt is removed prior to any wash treatments. Pre Spotting : We use specialist spot and stain removal techniques to ensure the very best results. Full Immersion Wash : Combined with water and wash detergents ensuring your curtains are protected, we use eco-friendly products for curtain cleaning. To find out more and get a free price offer for one or more of our curtain cleaning Brisbane, Call 1300 068 194 or send us an online request here from INQUIRY. Our customer care center is waiting for you! Our professional Curtain Cleaners Brisbane makes your curtains hygienic and saves you from various allergies. All cleaners are certified and well trained to use advanced equipments and techniques for cleaning curtains and drapes cleaning. We guarantee after we left your premises your curtains will look, smell and feel great. The processes do not require curtains to be taken down and out of your home, all methods will be completed successfully simply try our services and bring over to its quality. Ever since we first began offering friendly, local curtain cleaning services to the people and business owners residing in Brisbane, we have been striving to reach and surpass our customer’s’ expectations for high-quality, efficient and affordable cleaning services. We provide a wide range of cleaning job to domestic and commercial customers from all over the area. We are constantly following all of the latest developments and tendencies in the cleaning industry. We have invested in purchasing the best, safest and innovative cleaning equipment. Only professional, safe and eco friendly detergents are used in the procedures and all our friendly and experienced cleaners provides the best curtain cleaning service. Curtain Steam Cleaning Brisbane services is a part of Tom’s Curtain Cleaning, Call on 1300 068 194 for On site Curtain Cleaning Brisbane services. Domestic laundry may risk having your curtains shrink, crease or wrinkle after wash. Professional Curtain Steam cleaning Brisbane reduces damage to the fabric material and the design. Curtain tends to absorb stains and odours in your home. Tom’s Curtain Cleaning Brisbane would then be useful as the cleaning solvent ease the removal of mould, odours and tough stains. Some curtains would fade or the colours bleed when washed with water. Our curtain steam cleaning specialists are experienced and know very well the appropriate cleaning method for the various fabrics. Nearly all homes in Brisbane have dust mites due to high humidity. Dust mites are minute insects that generally feed on the flakes of human skin. These dust mites can be found on curtains and other fabric covered items and their feces can cause allergic reactions and trigger asthma attacks. Tom’s Curtain Steam cleaning Brisbane service can easily kill 100% of all dust mites and free your curtains of allergens. 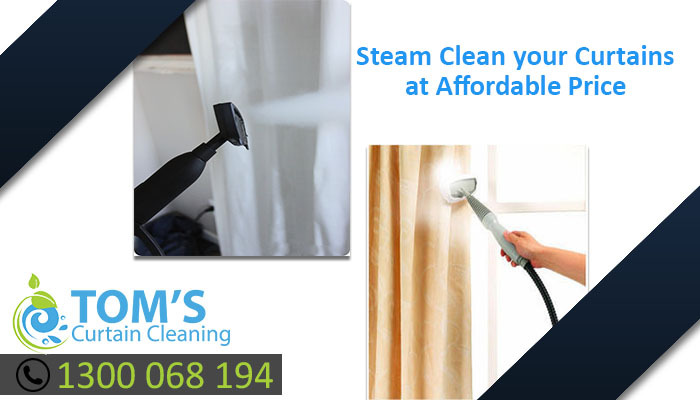 Tom’s Curtain steam cleaning Brisbane service is designed for effortless cleaning and has a multitude of advantages. Not only does this type of cleaning remove grime and dirt, it is also used to make the curtains completely germ free. Tom’s Curtain steam cleaning Brisbane don’t make use of any chemical substances to carry out the cleaning process, which implies that they are eco friendly and are not hazardous to your health. It is the most eco friendly way to have your curtains cleaned. And the most imperative thing is, it is totally safe for your children and pets. Tom’s Curtain steam cleaning Brisbane service helps to eliminate the bad odors and stains from your curtains. It can also get rid of stubborn stains. This cleaning technique can essentially prolong your curtain’s life and revive its fancy looks. Nowadays, curtain steam cleaning is amongst the most preferred ways for curtain cleaning in Brisbane as well as all over the world. The steam works its way through the threads of the cloth and removes any trapped dust without damaging the fabric. Tom’s Curtain steam cleaning Brisbane offers lot of advantages. The curtains can be extremely costly, which is why hiring the services of a professional curtain cleaning company can be very beneficial. The more stylish and expensive your curtains are, the more you must consider hiring a professional to avoid any kind of damage. For On Site Curtain Cleaning Brisbane Call On 1300 068 194! Tom’s Cleaning Brisbane is probably the best curtain cleaning company in Brisbane that uses latest steam cleaning machines to not only clean curtains but sanitize and deodorize your curtains right where they are hanging ! We Steam Clean Curtains in your premises without removing them, Curtain Steam cleaning is carried out on-site. We use the proper equipments and non-toxic / eco-friendly chemical to remove bacteria and odour. It will refresh the curtains. We strive to ensure the best possible curtain steam cleaning services are provided for every visit we make. Curtains cleaning form a basic part of residential cleaning and with Tom’s Curtain Steam Cleaning Brisbane to help you it shouldn’t be very difficult. We offer same day curtain cleaning services in Brisbane to keep your curtains clean and healthy through the latest cleaning techniques, equipment and materials. We also offer same day curtain cleaning for Commercial. You will not have to spend your valuable time or effort cleaning your curtains or send them off and pick them up from cleaners. Our Curtain Cleaners will come to your home with all the necessary equipment and will clean your curtains so that they do not have any dust, grime or dirt. Tom’s Curtain Cleaning provides best Curtain Dry Cleaning Brisbane services, also offers Curtain Laundry Brisbane services with free pick-up & delivery. Same Day Curtain Cleaning Brisbane – 1300068194. Our specialised services will effectively remove all accumulated dust, dirt and allergens from your curtains. You can rest assure that we are able to restore any type of curtains. Curtain Dry Cleaning Brisbane is very common way of cleaning curtain. The reason is dry cleaning process doesn’t involve any liquid which prevent shrinkage as well as colour fading on your curtain. We strongly recommend you to dry clean your curtain at least every quarter because stain or dirt on your curtain would be difficult to get rid as its dry up over time. Our Specialised curtain dry cleaning Brisbane services removes dirt and stains accumulated over time. Every piece of your curtain is treated separately according to label instruction and fabric type. We suggest curtain cleaning done on every six months basis. If you are planning to dry wash your drapes or curtains, Call 1300 068 194 today! Dry cleaning curtains is the most effective way to rid your curtains of accumulated dust, dirt and allergens. Whether it’s a single pair of curtains or elaborate swags and tails, we have the expertise to restore them to their former glory. Dry powder or a professional solved is applied to the item and carefully rubbed in with rotating brushes. This effectively loosens the accumulated dust and deodorise the piece. At the end, it is thoroughly vacuum-cleaned to removes all substances and dirt. Our Staff will visit your home or office to weight your curtain for you! Our curtain dry cleaning team would provide professional suggestions as well as services to your door step! Free Pick Up & Delivery, Free Estimate Call on 1300 068 194!